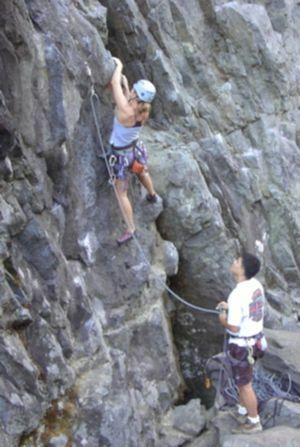 Rock climbing, often considered by non-climbers to be a reckless, dangerous, "thrill-seeking" sport, can also be a fun way to push oneself to one's physical and mental limits; climbing also presents an excellent incentive to seek out some of the most beautiful places in the world in search of some fresh rock. The British Mountaineering Council (BMC) is Britain's representative body that exists to protect the freedoms and promote the interests of climbers, hill walkers and mountaineers, including ski-mountaineers. The BMC recognises that climbing, hill walking and mountaineering are activities with a danger of personal injury or death. Participants in these activities should be aware of and accept these risks and be responsible for their own actions. Care free days on the rock. There are many different forms of climbing that are segmented mostly by the type of equipment used when climbing. The two main categories are aid climbing and free climbing. Aid climbing is a style in which equipment, such as pitons, cams, nuts and/or screws, are placed allowing the climber to pull on them and haul himself upward. Free climbing, the style typically referred to by the general term "rock climbing," is a style in which the climber moves forward and upward solely by gripping, squeezing, smearing, pinching -- with whatever natural strength he can muster -- the available natural features of the rock. Ropes and other equipment are used solely for protection in the case of an accidental fall, not to aid in the ascent. Free climbing is further categorized by the type of protection used. Climber & belayer: the basic climbing team. 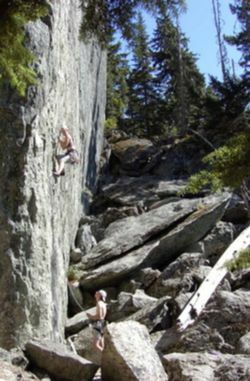 Trad climbing (short for "traditional") involves the placement of temporary protection such as cams, nuts, and hexes, into the rock's natural features while ascending. This method is appropriate for nearly every type of rock, but requires a significant amount of safety equipment. Sport climbing involves the use of pre-set protection, often metal rings (known as bolts) drilled into the rock, while climbing upward. These fixtures are permanent and used when the climber runs his rope through one end of a quickdraw and attaches the other end to the bolt. This method requires less equipment than trad climbing, but requires protection devices already to be set into the route. Top roping involves climbing using a rope that is anchored at the top of the route as protection. This method uses the least equipment, but requires the area to have access to the top of the face (for instance, many cliffs have walkable paths to the top) or for a climber to first ascend using some other method, then to set the anchor and lower the rope. This method frees the climber of the need to set protection while climbing, making it the safest and easiest method for beginner and intermediate climbers (provided someone experienced is present to set a proper anchor). Bouldering is centered around climbing shorter and more difficult routes, known as problems, that are not high enough to require a rope. Bouldering does not use any protection either aside from foam pads known as crash pads, which are usually placed at the bottom to protect against rough landings. The availability of rock climbing courses depends on your location. Indoor climbing gyms invariably offer courses. If your area includes any natural formations appealing to rock climbers, chances are good there is also a nearby climbing or mountaineering organization that will offer (or know of) opportunities to learn more. Rock climbing shoes are made to fit extremly tightly. They have rubbery soles which help grip the rock walls and are often curved. A harness wraps around the waist and upper thighs of a climber and protects the climber in the event of a fall--assuming he's tied into a properly protected rope. Harnesses usually have several hooks to carry other pieces of gear. Bouldering does not require a harness. A helmet is recommended both for climbers and belayers. It is not uncommon for a person climbing to flip or swing during a fall, potentially hitting his/her head on nearby rock. Nor is it impossible for rocks, cams, carabiners, or other objects to be knocked loose from the wall or dropped while climbing, posing a danger to unprotected climbers and belayers below. Webbing and Cords are used in slings, runners, harnesses, anchor extensions and quickdraws. Slings are used to set up top ropes and to prevent rope abrasion. Cams are devices used for protection when placed in cracks. It acts in a way simular to a bolt and quickdraw using a crack. The cost of climbing in many cases is free. Some locations charge day rates that are generally associated with the entrance fee and not for the sport of climbing. Per the above discussion, falls can have serious results, whether accidental, due to equipment failure or careless attempts. Accordingly, some travel insurers may consider it a dangerous activity, and may demand special coverage at added cost. Great rock climbing can be found worldwide; not surprisingly, you'll often find great places to climb in some of the most beautiful and scenic places on Earth. Morgan's Bay - Over 400 routes on sea cliffs approx 60 metres high. Tasmania is a lovely island with lots of coastal climbs. Because its so far south, it stays a lot cooler than the mainland. Kangaroo Point Everyone knows of this climbing area in Brisbane next to the river, right in the middle of the city. This Himalayan kingdom offers numerous sites suitable for rock climbing, but a popular site place near the capital, Thimphu is called 'the Nose'. Yangshuo, and more generally the Guilin area, in Guangxi Province, China has extensive karst limestone formations and an active climbing scene. Equipment rental and guides are readily available. There is also climbing in Tibet and regions bordering it such as Northern Yunnan and Western Sichuan. Much of it is mountain climbing, rather than just rock climbing. An extreme possibility — definitely only for experts with topnotch equipment and professional guides — would be to climb the North Face of Mount Everest from Qomolangma in Tibet. Climbing season in Laos is from November to March. Rock mainly consists of limestone similar to Thailand. Nong Khiaw is the latest, but not least beautiful place to climb. Stunning mountain walls are waiting for pioneers now coming. Thakhek has over 300 sports climbing routes and a climber resort called Green Climbers Home. Badami has several sport climbing routes on amazing sandstone. Bangalore has several areas around the city for bouldering, sport climbing and trad. Also has a few artificial climbing walls in the city. A fantastic local community of climbers welcomes resident and visiting climbers all year round to climb with them. Hampi has world-class bouldering and attracts several climbers from all over the world. Batu Cave - 13 km north of Kuala Lumpur, Malaysia — Rai Leh's little brother to the south, Batu Cave features over two hundred bolted limestone routes on powerful overhanging rock that features stalactites and caves. Nepal is in IFMGA from 2012 so there are many rock climbing sports which are set by NNMGA(Nepal National Mountain Guide Association) 1> Nagarjune Rock climbing sport (inside Shivapuri National Park). Rock is Lime stone and Grading is 5a+ to 7a+ (French Grade). 2> Hatiban Rock climbing sport ( on the way to Dhachinkali Mandir. Rock is Lime stone and Grading is till 7a+. 3> Bimal Nagar Rock climbing sport. Rock is Lime stone and 4 pitches Rock and Grading is till 7a+. Beside the big moutains there is also the possibility just to climb cliffs in Nepal. Pakistan has thousands of beautiful and extreme routes & rocks but unfortunately they are unexplored. A few location are given below. Trango Towers - This is considered to be the most difficult and dangerous Rock climb in the world there are thousands of routes just in this huge rock mountain. Location: Baltistan, Pakistan. Naran & Kaghan- Huge rocky Mountains with a lot of new unexplored beaty. Chillas After crossing Rai Qote Bridge (the rocky track to fairy meadows) one can see an ocean of Boulders from small to really huge and even over hanging rocks. Khanpur Near Khanpur Dam one will will find the most beautfull rocks from easy of extreme level. The rocks are cool and are opposite to the sun which makes in very pleasant in all seasons. Rai Leh and neighbouring Ton Sai - Krabi province — the preeminent location for rock climbing in Asia and possibly the world. Easy access to superb limestone climbing, beautiful scenery and ground level activities are good reasons why this area is so popular. Climbing is possible all year but November - April is the driest and least humid. Koh Tao in the Gulf of Thailand has an up and coming climbing scene with huge granite boulders dotting the island. Those looking for cooler temperatures, a different backdrop, or just another destination for superb, steep, limestone climbing are increasingly heading north to Crazy Horse Buttress, located just 35 kilometers east of downtown Chiang Mai. Boasting more than 130 bolted routes between (French system) 5 and 8a, with some up to three pitches high, Crazy Horse is the perfect destination for experienced and novice climbers alike. Split - With over 400 bolted rock climbing routes in Split area climbers of all age and experience can take part in rock climbing adventure created for everyone who wants to have thrill of climbing rocks. Rovinj - has a huge climbing area nearby and is a great starting point for journeys to other climbing areas in the region. Paklenica - a national park with bolted routes up to 350 m high at Croatian coast. Pecka - climbing area with over 70 amazing routes, beautiful nature and great local hospitality. Kameni most - climbing area near Banja Luka. Canyon Tijesno - bolted routes up to 100 m high with amazing view of river Vrbas. Adršpašské skaly - beautiful, sandstone. Fontainebleau - Fontainebleau is a world famous bouldering spot. Boulder problems are linked by 'circuits' making the problems continuous from boulder to boulder. Chamnoix, SE France - A lifetime of multi-pitch sport, limestone + endless alpine Granite for trad work. Kalymnos — the scene of frenetic climbing activity over the past five years. Kalymnos is a popular climbing destination not just because of its island location but because of the walls and walls of featured limestone that feature over two and a half thousand bolted routes (2013). Everything from slabby technical routes to overhanging tuffa and stalactite routes can be found within walking distance of your ocean front accommodation. Climbing is possible year round but the best times to visit are spring (March-May) and fall (September-November). Over the last years there are international climbing festivals being held (mainly in October) with thousands of participants, among whom there are many professional climbers. The past two ones were organised by the North Face and there is one more to come in 2014. Arco (Northern Italy) - One of the most popular climbing spots in Europe. Sardinia — offers a splendid variety of climbing: from limestone to granite, sport to trad, beach-side to inland, bouldering to long multipitch; Sardinia has something to offer the beginner to the expert climbing and everyone in between. Check out Cala Gonone, Isili and Dumosnovas among the hundred areas to climb on the island. Finale Ligure - famous climbing area with over 2000 routes in a small area, most with stunning views of the Mediterranean. Romsdalen - Famous for the Trollveggen (aid climbing). You can find all types of climbing here. Lofoten - Straght from the water, spectacular view! Multipitch granite trad climbing (mostly). Of the highest quality in the world. Hell - Near Trondheim. Conglomerate, not very tall (10-20 m), but will give anyone a real challenge. Innerdalen - Norway's most beautiful valley. Mostly trad ~10 pitch. May-Oct.
Flatanger - Some of the worlds best sport climbing. Massive cave. Has some of the hardest routes in the world. 3 hours northwest of Trondheim. Peaceful, beautiful, good! Approx. same season as Innerdalen. Harbak and Vingsand - Beautiful bouldering by the sea. Harbak is a bit more congested (route-wise) but Vingsand maybe has more high quality lines. Hard to find beta for Vingsand. Guidebook for Harbak. Approx. 2-3 hours from Trondheim. Grdoba - (Valjevo) Really nice rock in forest with bautiful nature. About 80 routes , small holds , overhanging and kind of difficult routes. If you are climbing between 7b and 8b you will enjoy it a lot. Costa Blanca - A region on the East coast of Spain with many fine limestone cliffs. Albarracin - Situated to the east of Madrid. Great bouldering. Mallorca - famous for deep water soloing. Kjugekull - Kjugekull is a beautiful nature reserve offering hundreds of very good boulder problems. Kullen - A wonderful small peninsula with seacliffs all over. Mostly trad climbing. Also good for diving! Göteborg Loads of good climbing only a short drive from the city center. Sanetsch - famous spot between Bern and Valais. Grimsel - 450 m high granite slabs above a green mountain lake. Ponte Brolla - fun sport climbing in a beautiful area near Locarno. Basel Jura - loads of single pitch sports climbs on good quality limstone. Geyikbayırı - South part of Turkey, near Antalya. The biggest and the best sport climbing areas of Turkey. More than 700 routes and 40 sectors.Avarage air temperature is 20 degrees in winter season. Good quality limestone. Squamish, BC - Multipitch traditional (gear) climbing on bullet-proof granite cracks, flakes and slab. May through October is a fine time for climbing. July through early October are your best chances for superb dry and warm days. Whistler, BC - Predominantly single pitch sport routes on solid featured rock that is mostly vertical or slightly overhanging. Late May through early October is your best bet for good weather. Access to the local crags is by car and the approaches are usually short and easy (2 - 20 minutes). Skaha - Penticton, BC - Primarily single pitch climbing on gneiss stone featuring small edges and crimps. The routes are divided almost evenly between traditional and sport climbing on everything from overhanging jug-fests to vertical cracks to delicate less-than-vertical routes. Climbing is possible during a good portion of the year (April - October) though the summer months (July & August) can become uncomfortably hot requiring you to climb in the available shade. Kamloops, BC - Kamloops has enough climbing to keep you busy for a weekend. As the area can become extremely hot in the summer, spring and fall are the best times to visit to check out the vertical climbing on solid featured rock. Canmore, Alberta - Canmore offers a wide range of limestone sport routes and is considered by some to be the best sport climbing area in Canada. Some of Canada's most difficult routes are located here, and most of the climbing is within 10 minutes of downtown. Canmore features lots of single pitch climbing, and a few long multipitch climbs; including Sisyphus Summits on the North face of Ha Ling peak which at 25 pitches is Canada's longest sport route. Climb between May and September. Val David, Quebec - More than 500 routes within the Dufresne Regional Park have been listed and rated. Great climbing challenges are close at hand for all comers, from beginners to experts. Bishop, California. A bouldering mecca of the world. Has thousands of problems ranging from beginner to expert. Bouldering is divided into three sectors, the Buttermilks which are granite boulders, the Happy Boulders and the Sad boulders which are primarily volcanic rock. Black Canyon of the Gunnison National Park, Colorado - A steep, narrow gorge for only the most experienced climbers. Mount Lemmon - Tucson, Arizona — the massive variation in elevation makes this area climbable all year around. Scorching summer temperatures in the city valley can be escaped by moving out of the cactus and into the forest. Red Rock Canyon - Las Vegas, Nevada - Practically limitless climbs. Great for climbers looking to explore sandstone cliffs. A great variety of sport and trad climbs of all levels including bouldering and multi-pitch (and multi-day) climbs. Maple Canyon - Central Utah — sport climbing heaven on cobble stone routes. Ideal climbing conditions are late spring through early fall. When the summer heat consumes Utah, the canyon remains cool and the routes steep and pumpy. Austin, Texas - This city has tons of limestone sport climbing routes in and around, including deepwater soloing at a nearby lake, as well as limestone bouldering and pink granite at Enchanted Rock two hours to the west. Enchanted Rock (E-Rock) - Fredericksberg, Texas - Two giant domes with various rock climbing area around. Great for beginners looking for rock climbing lessons. Rock material is granite. Hueco Tanks - El Paso, Texas - Great bouldering, with hundreds of bouldering problems of all levels. Devil's Lake Wisconsin - Baraboo, Wisconsin - No big walls, but one of the world's great top-roping paradises with almost 2,000 named routes and deep climbing history. City of Rocks National Reserve - Southern Idaho — Gear and sport climbing on massive piles of granite scattered about a scenic valley. Climbing is best in the late spring through early fall. Smith Rock - Bend, Oregon — the birthplace of American sport climbing. Best climbed in the spring and fall. Frenchman Coulee - Central Washington — features row after row of 30 m basalt columns hosting over 400 sport and gear routes. Ideal climbing conditions are in the spring (March - May) and fall (September - November) as summers tend to be hot and windy. Sinks Canyon - Lander, Wyoming - hundreds if not thousands of incredible limestone, sandstone, and granite sport climbs for every ability; all within a ~3-5 mile canyon. Incredible boulder band offering easy to the most challenging boulder moves, especially at the sandstone buttress. Great weather pattern makes climbing available throughout most of the year. There can be snow on one side of the half mile wide canyon and be 20 degrees warmer on the other side. A necessary destination for every climber. Leavenworth - Central Washington — a wide variety of high quality granite crags at lower elevation and long multipitch alpine routes higher up. Index - Western Washington — steep granite cliffs known for hard multipitch trad and a handful of aid lines. A summer destination when winter/spring rains have past. Shawangunks - New Paltz, New York - the best trad climbing on the East Coast. 1.5 hours north of New York City. Hundreds of long multi pitch routes including many roofs, horizontal crack lines and bouldering areas. Seneca Rocks- Monongahela National Forest - great trad climbing in the Northeast US. Routes range from 5.2 to 5.13. New River Gorge - West Virginia - months of climbs, nice variety of grades, excellent views of the gorge! Currently seeing lots of new development of routes. Red River Gorge - Kentucky - many well-traveled North American climbers state that the Red is the best crag on the continent. A nice mix of traditional cracks, and power endurance relentlessly overhanging sport routes on bullet-proof sandstone. Can be very humid in the summer months. Serra do Cipó (Minas Gerais) - The best sport climbing crag in Brazil - great quality limestone. Approximately 400 routes (55 meters max) (8c/5.14c is the maximum difficulty, but there are several unclimbed projects). Sabará - Pedra Rachada (Minas Gerais) - Great bouldering area with the most complete guidebook of Brazil. Amazing views and amazing lines. Cochamó Valley - Chile's premier climbing destination, known as the Yosemite of South America, with a variety of granite big walls and crags. Summits include breath-taking views from peaks. Climbers from all parts of the world are continually establishing new routes amongst its endless potential of walls. Any kind of climbing using ropes is a common exclusion from travel insurance policies. Read your policy; if you would like to be insured for medical treatment or other costs associated with rock climbing injuries while traveling internationally, you may need to take out a second insurance policy (or rider) from a company specializing in adventure or sporting insurance. This page was last edited on 23 January 2018, at 11:13.